CITAC arose out of an international workshop held in association with the Pittsburgh Conference in Atlanta in March 1993. The aim of this workshop was to discuss how analytical activities could be developed to meet the needs of the 21st century. It identified a wide variety of issues to be addressed to ensure that analytical measurements made in differencountries or at different times are comparable. For several years, CITAC has maintained a website containing programs and reports from events, publications (including a yearly newsletter-the latest being February 2002), contact details, and more. For more informations about CITAC or its Web site contact Ioannis Papadakis, CITAC Secretary at citac@irmm.jrc.be. To promote in-country capacity building in information production, organization, access and dissemination. The INASP Web site contains sections on events, links, publications, African Journals Online, program information, and more. An archive of INASP newsletters, including the February 2002 edition, are also available on the site. For many years, K.R. Jolls et. al. have developed computer visualization techniques for application to thermodynamics. The results (i.e., methods, software, and images) can be used in teaching thermodynamics at a variety of levels. For example, the tutorial program "Phase" produces fixed and movable three-dimensional phase diagrams of pure, binary, and ternary systems in the vapor-liquid phase-change regions (See "An Eye for the Abstract," Science, Oct. 15, 1999, p. 430). More recently, the group has created the Gibbs Models Web site, that is a hierarchical collection of drawings of various surfaces depicting 3-dimensional, parametric sections of thermodynamic fundamental and state functions for pure, binary, and ternary systems. 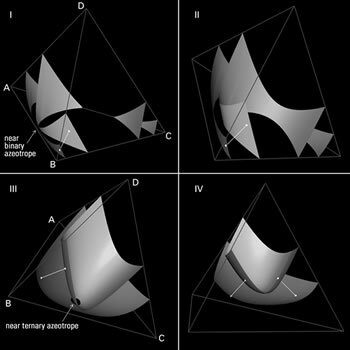 These images were generated by "Animate," software for visualizing higher-dimensional VLE. Concept and programming by Eric Cochran and Kenneth R. Jolls, Chemical Engineering Department, Iowa State University. Coexisting states were calculated from the Peng-Robinson equation using common mixture rules. Computations were performed using ASPEN PLUS. Vapor-liquid equilibrium in the quaternary system acetonitrile (A), benzene (B), ethanol (C), and acetone (D) at T ° 348K. Light (inner) surfaces denote dew-point states, dark surfaces bubble-point states. Random white tie-lines are drawn. The originals are in color. Views I-IV are at successively higher pressures. View I is at a pressure intermediate to the A-B and A-C binary azeotropes while view II is above the A-C but below the B-C azeotrope. View III is at a pressure just below the A-B-C ternary azeotrope, and IV is in the range where simple VLE persists up to the vapor pressure of acetone.